Good news! You can also participate in Philippine Stock Market even if you are outside the country or living far from PSE Building at Ortigas Centre. From my previous post, Start Investing in Stock Market With COL Financial, I only tackled how you can open an account when you’re here in the Philippines (actually when you are in Manila area because I mentioned that you have to go to CisitisecOnline Office). Since I have friends who also work abroad, I inquired in CitisecOnline/COL Financial how they can open an account even when they are not living in Manila area. a. I am Filipino living within the Philippines but far from PSE Building at Ortigas. Step1. Fill out all the forms with information needed. Note: Email Address is important as they will send your credentials here. (By credentials, I mean your account number and log-in details to access your account in CitisecOnline system). Local Bank Account is needed because your withdrawals from CitisecOnline will be deposited here. 4. Enter your BPI account number and Joint Account Indicator No. electronic banking services where you may want to pay your bills in the future. * You should receive a confirmation email from BDO if payment was successful. 3. Under Special bill, select COL FINANCIAL GROUP, INC.
5. Enter your Phone No. * You should receive a confirmation email from Metrobank if payment was successful. Follow Steps 1 to 2 above. 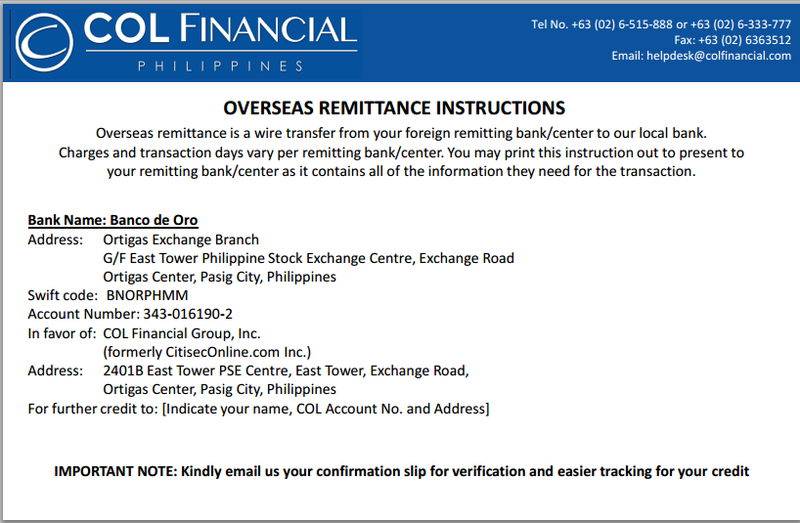 Pay through Overseas Remittance via Banco de Oro. Instructions directly taken from COL Financial site. Information given here is either taken from www.colfinancial.com or directly inquired from COL Financial’s office. Learn the Right Formula to Save.